Top-billed actors will bring the beloved characters of McDuck Manor to life in the all-new animated comedy series "DuckTales," premiering in Summer 2017 on Disney XD channels around the world. 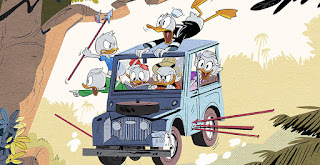 Leading the quack pack on globe-trotting adventures are David Tennant as Scrooge McDuck; Danny Pudi, Ben Schwartz and Bobby Moynihan as the voices of mischief-making Huey, Dewey and Louie, respectively; Beck Bennett as Launchpad McQuack; Toks Olagundoye as Mrs. Beakley; and Kate Micucci as Webby Vanderquack. The cast was revealed today in a video of the actors singing a rendition of the original "DuckTales" theme song. Dive in for the musics!! Other beloved characters slated to appear are Donald Duck, Flintheart Glomgold, Gyro Gearloose, Duckworth, Gizmoduck, Magica DeSpell, Gladstone Gander, and Ma Beagle and the Beagle Boys. Based on the Emmy Award-winning series treasured by a generation of viewers, the new "DuckTales" is produced by Disney Television Animation. Annie Award nominee Matt Youngberg ("Ben 10: Omniverse") is executive producer. The story editor and co-producer is Francisco Angones (Disney XD's Emmy Award-nominated "Wander Over Yonder") and the art director is Sean Jimenez (Disney XD's Annie Award-winning "Gravity Falls").